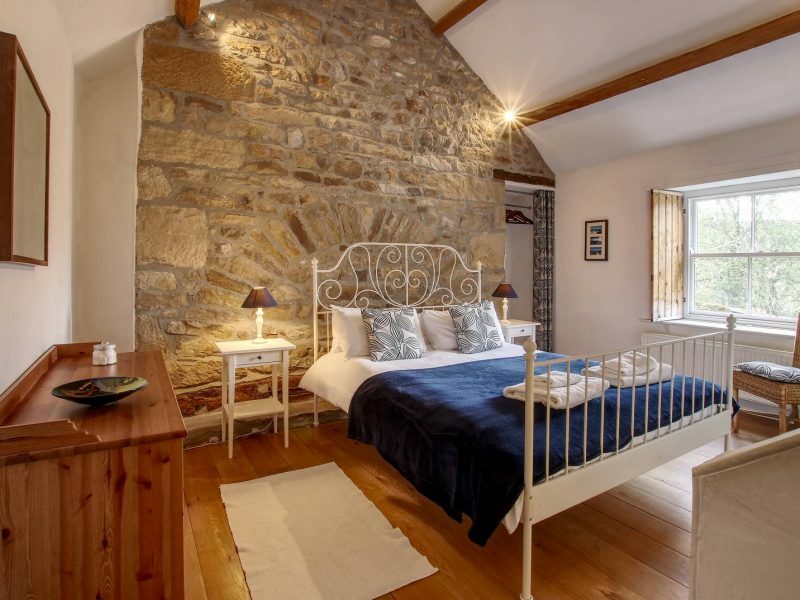 Hindlethwaite Hall accommodates up to 6 people in three en suite bedrooms, a double in the master bedroom and the option for the other two bedrooms to be set up as doubles or twins. 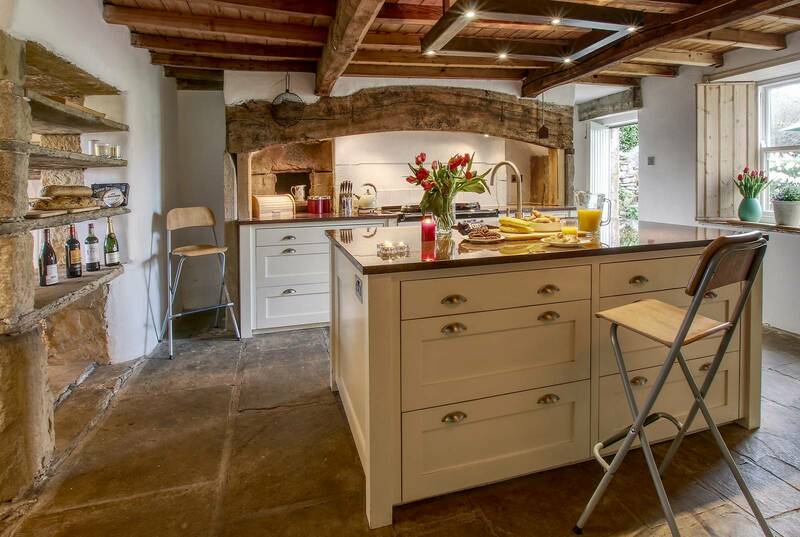 Spacious living areas with log fires make a cosy place to relax and the fully equipped kitchen with Aga has all your need for your culinary needs. 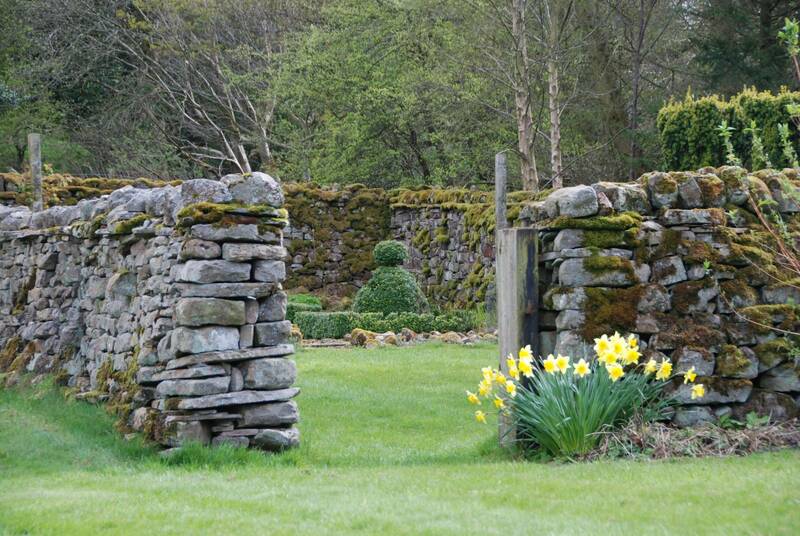 The large garden provides plenty of space for dogs to run around or to soak up the surrounding views. The focus of the spacious drawing room is a magnificent Inglenook style open fireplace with all logs provided. The adjoining snug is equipped with TV, Freesat and DVD with a wood burning stove. 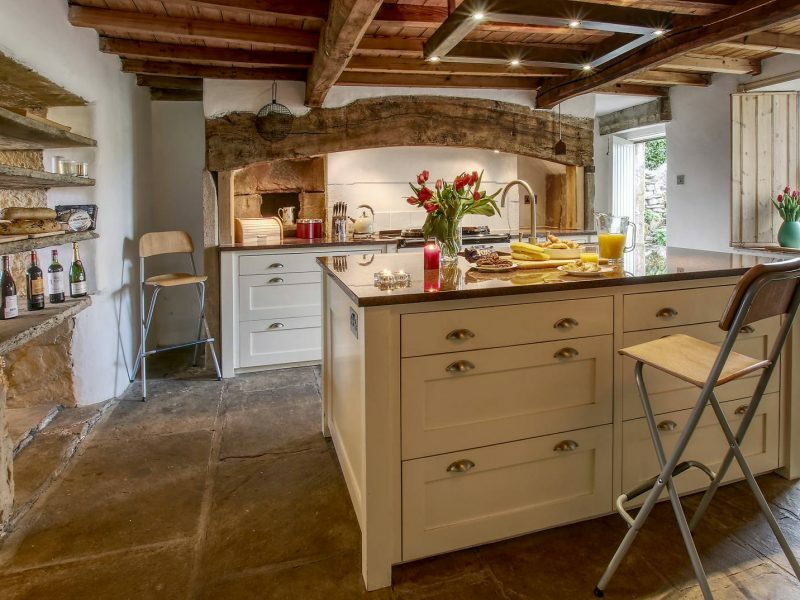 The Kitchen/Breakfast room features a granite work surfaces and an impressive beamed fireplace which houses the electric Aga and is fully equipped to the highest standards. The Kitchen opens onto a patio area and has magnificent views up the Coverdale valley towards Little and Great Whernside. The adjoining dining room seats 6. There is a large utility room/wc with washing machine and tumble dryer. 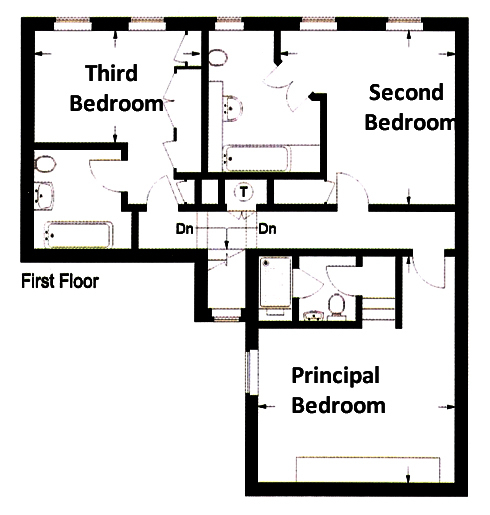 The three en-suite bedrooms are on the first floor. 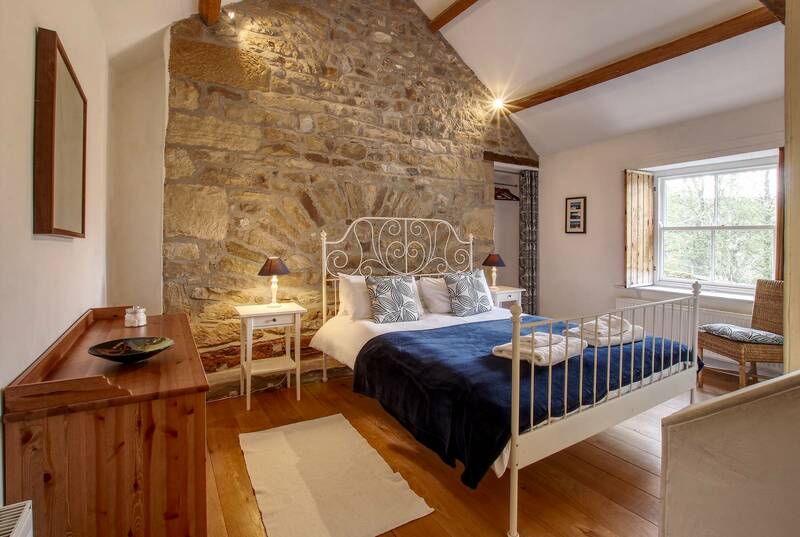 The principal bedroom with an impressive beamed eves ceiling is very light and airy with a kingsize bed and en-suite shower room. 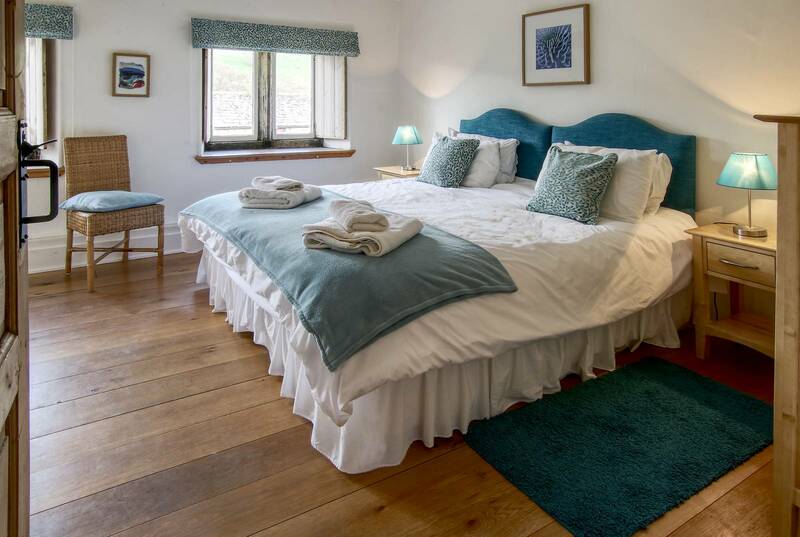 The second bedroom has a super kingsize bed (which can be split into two 3ft singles) and en suite bathroom, including overbath shower. The third Bedroom also has a super kingsize bed (which can be split into two 3ft singles) en suite bathroom with handheld shower. Hindlethwaite Hall is a Grade II listed holiday retreat near Horsehouse in Yorkshire. 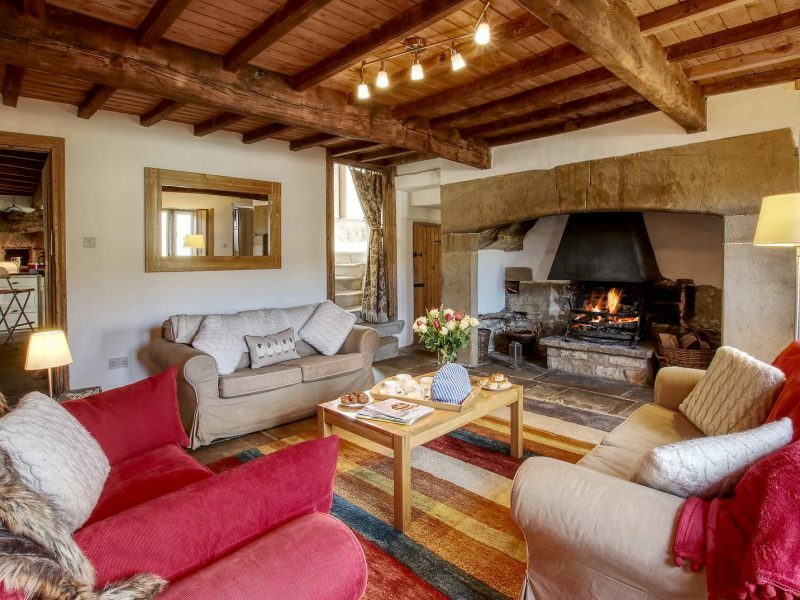 This luxury 16th century holiday Farmhouse occupies a very private and secluded setting within the Yorkshire Dales National Park, with magnificent views over outstanding Coverdale countryside. 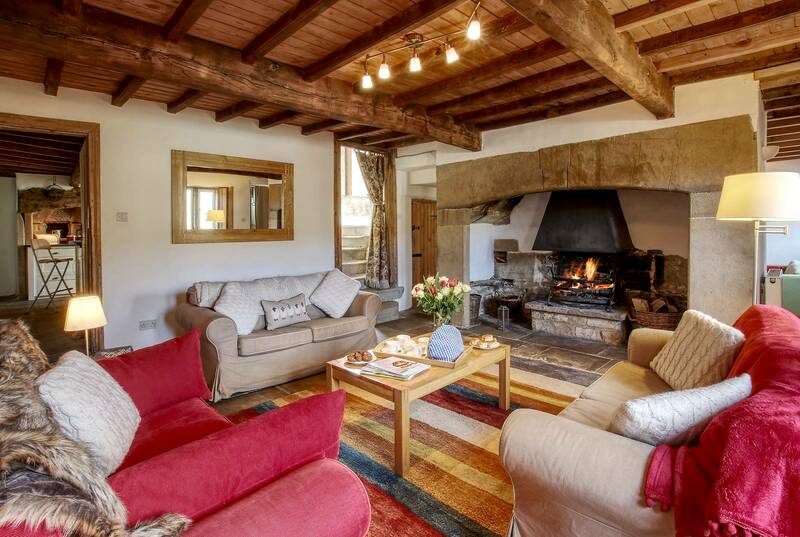 It is approached down a half mile track, over a delightful humpback bridge off the Middleham to Kettlewell Road to the north east of the village of Horsehouse. This Yorkshire village has a church and a pub, 500yards by a footpath. 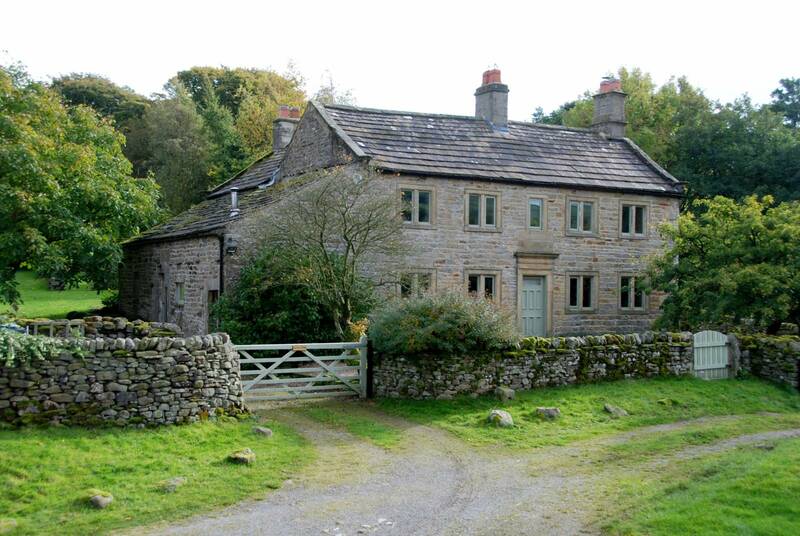 The self catering rental is in an ideal location for an outdoor break in Yorkshire with walks either from the door, or in neighbouring Wharfedale and Wensleydale, nearby Malham and Swaledale. 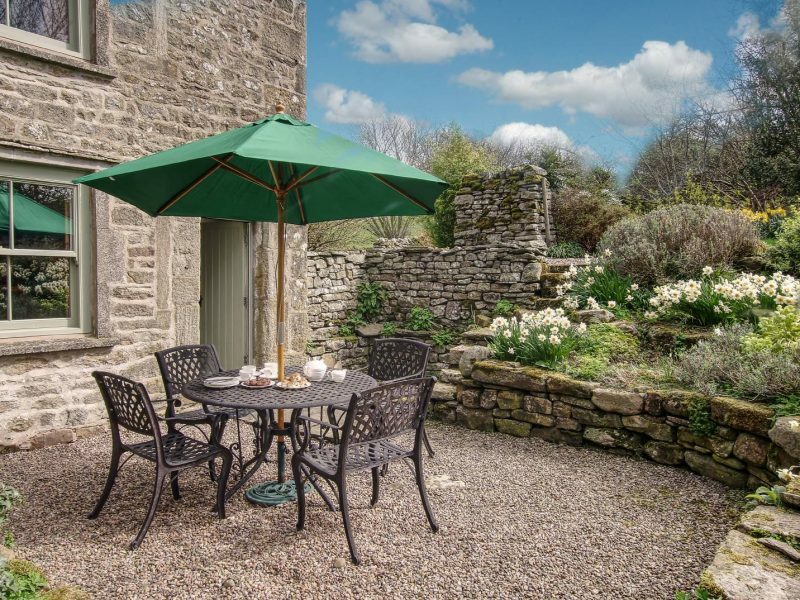 Holiday guests can also tour the Yorkshire Dales National Park with its splendid natural scenery, picturesque villages and market towns, castles and abbeys – all of which are in driving distance. 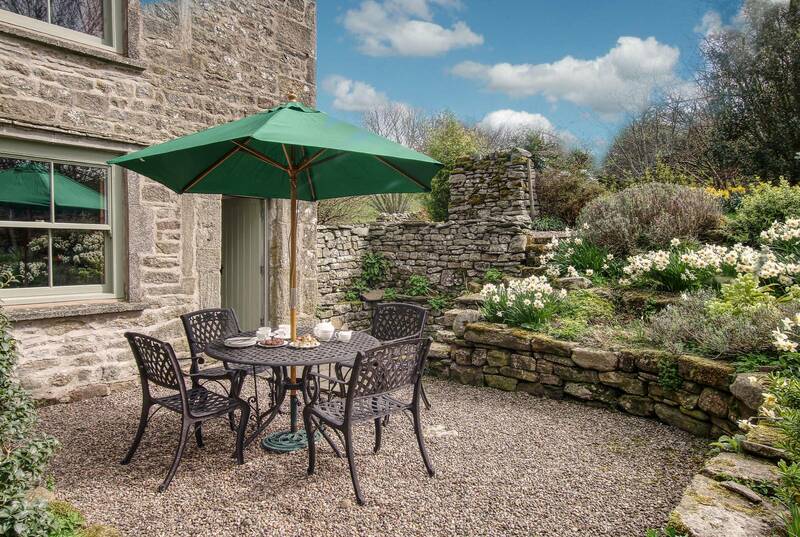 Leyburn (9 miles) has full facilities (supermarket, petrol etc) as well as a weekly market. 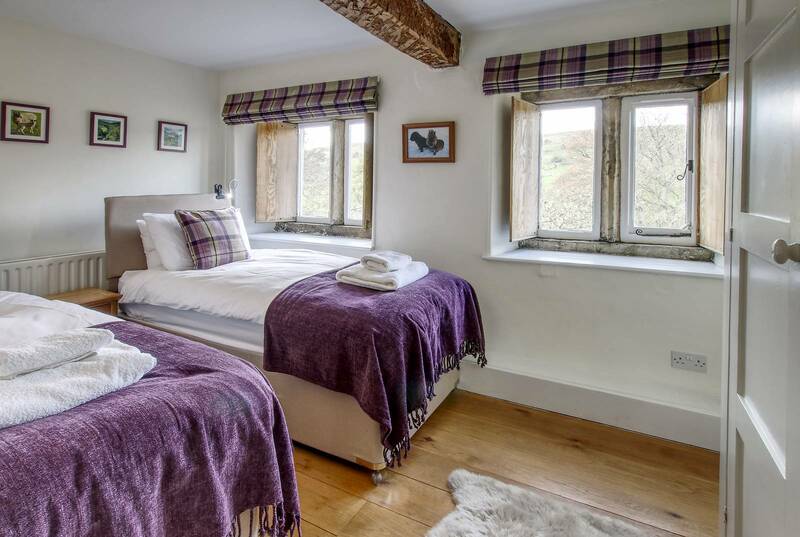 Whether you plan to just soak up the peace and tranquillity of the house and garden or to enjoy more of the local area, we are sure you will enjoy your stay. Nearby are some beautiful parts of the British countryside which, if you have the time and energy, we would recommend you explore. We look forward to welcoming you. If you have any queries or require any assistance please phone 07768 076729 or email info@hindlethwaitehall.com. For full details and maps of how to reach us please see the directions section of our website www.hindlethwaitehall.com. Alternatively, you can plan your journey by car or public transport using www.transportdirect.info; simply enter your postcode and ours, which is DL8 4TS to get directions. The nearest railway station is Northallerton which is 24 miles away. Taxis are available at the station. If you require an accessible taxi this can be booked in advance, see contact information for details. Please note that the road from either Kettlewell or Middleham is a minor road. Do please take care as it is narrow in several places. The house signposted from the road and is accessed via an untarmaced farm track. Whilst most cars will have no difficulty care needs to be taken if wheel clearance is low. Parking is available in the gravelled area to the side of the house within the grounds of the property. 3 cars can be comfortably parked. The stairs and 1st floor passageways are well lit using a combination of ceiling and wall lights. The staircase to the first floor has 12 steps with a small landing in the middle and the top. Being the original cottage staircase, it is unusual in having a 180 degree change of direction. There is a rope handrail and the floor is stone flagged. The door opening to the lounge is 760mm/30ins wide. The floor is stone flagged with rug carpet. In the snug there are two sofas and additional wicker seats. In the snug there is a 32ins wide TV with satellite Freesat channels available. There is a DVD player. The dining room is situated on the ground floor with entry from the kitchen with a small step xxxx. The door openings to the dining room from the kitchen is 840mm/33ins wide. The dining table has legs on each corner, 660mm/26ins from floor to lowest point of table (underspace) and is 775mm/30.5ins high. Chairs (all moveable) – 6 chairs with padded seats that have no arms. Flooring is original stone flagging. 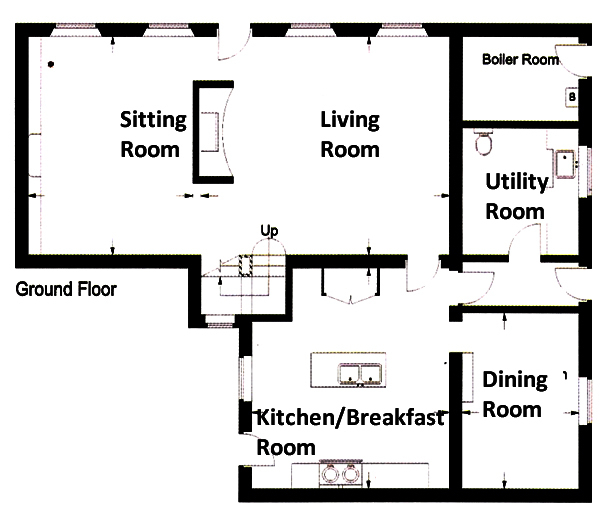 The kitchen is situated on the ground floor with step free, level access from the hallway. There is a small uneven step 50mm/2ins into the dining room. The door openings to the kitchen from both the hallway is 780mm/31ins and the dining room are 840mm/33ins wide. Fridge freezer available, highest shelf in fridge 940mm/37ins and lowest drawer in freezer 91150mm/45ins. The door opening from the top of the steps is 610mm/24ins wide. Within the bathroom there is a level entry, step free shower. There is a bath with an over bath shower. The door opening is 740mm/29ins wide. The room is lit by natural light and ceiling lights. A shoe and boot rack is provided with hooks for coats etc. We have a gravelled patio area which can be accessed from the kitchen by one step. Table & chairs with an umbrella are available on the patio. The garden area around 1/3rd acre consisting of a lawned area with a separate walled patio area. The house benefits from free wifi, linen. logs and full central heating. Both pets and children are welcome and appropriate equipment will be provided on request.